"Working within a modern idiom, Herzog & de Meuron is best known for its refined use of building materials. Whether using wood, concrete, glass, stone or metal alloys, the firm's projects invariably have the luster of gems. Light figures prominently in the designs, glowing softly through metallic screens or captured by the burnished texture of concrete floors. With translucent glass and veil-like metal facades, the architects treat walls as porous membranes between public and private space." After an extensive national and international search, the Walker Art Center selected the renowned Swiss architectural firm Herzog & de Meuron to design its expansion. In creating a model 21st-century arts center with audience engagement and experiential learning at its core, Herzog & de Meuron has developed a plan that will permit increased facilities allowing the Walker to share more of its resources--from objects in the permanent collection to books in its library to artists' creative processes. The planning also encompasses the development of a sophisticated infrastructure to support the presentation of art and provide for personalized learning, placing the Walker among the first technologically "smart" cultural facilities in the world. "Long before my first visit, I was aware of the Walker's daring, contemporary programs, and the opportunity to work with [Walker Director] Kathy Halbreich and [Walker Chief Curator] Richard Flood on the expansion project was extremely compelling," said Jacques Herzog. "This is a unique opportunity to work with an institution that truly has a multidisciplinary focus and deep connections to its communities. The support for the arts in the Twin Cities and the innovative nature of the Walker are a refreshing counterpoint to the conservative spirit you feel in so many other institutions and cities." Jacques Herzog and Pierre de Meuron are the recipients of the 2001 Pritzker Architecture Prize sponsored by the Hyatt Foundation of Los Angeles. 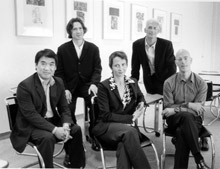 The firm's recent projects were showcased in the 2000-2001 Walker Art Center exhibition Herzog & de Meuron: In Process. Among the firm's many important international commissions are the Tate Modern in London, which opened to critical acclaim in May 2000, and the M. H. de Young Memorial Museum in Golden Gate Park, San Francisco, scheduled for completion in 2005. Its Dominus Winery project in California was selected by Time magazine for the Best of 1998 Design Award. Architect Christine Binswanger has been a partner in the firm since 1994. Born in Switzerland, Binswanger received a degree in architecture in 1990 from the Swiss Federal Institute of Technology (ETH), Zürich, and began collaborating with Herzog & de Meuron the following year. She is a visiting professor at the École Polytechnique Fedérale in Lausanne, Switzerland. John Cook, architect and vice-president with Hammel, Green and Abrahamson, Inc. (HGA), has worked on museums and other specialized cultural projects for most of his career. During the past decade his work in the Twin Cities has included the Frederick R. Weisman Art Museum at the University of Minnesota (with Frank O. Gehry and Associates), the Bakken Library and Museum, the Barbara Barker Center for Dance at the University of Minnesota, and the Shubert Theater, a future Hennepin Avenue landmark. In addition to the Walker's expansion project, Cook's current work includes the expansion/renovation of the University of Alaska Museum in Fairbanks and a chapel for the United Theological Seminary in New Brighton, Minnesota. Michel Desvigne, who received the Medal of the French Academy of Architecture (2000), has worked with leading international architects, including Sir Norman Foster, Rem Koolhaas (O.M.A. ), Jean Nouvel, I. M. Pei, Renzo Piano, and Richard Rogers. Among Desvigne's international landscape projects are the Millennium Park in London's Greenwich Peninsula; the Port Marianne area in Montpellier; the Jardin James Joyce in Paris' Seine-Rive Gauche area; three TGV Méditerranée railway stations in Southern France (Valence, Avignon, and Marseilles); the Sieroterapico Park in Milan; a public square near Amsterdam; and large parks surrounding the Centraal Museum of Utrecht, the Middelheim Museum in Antwerp, and the Fort Thungen Museum of Modern Art in Kirchberg, Luxembourg. Desvigne is a graduate of the Faculty of Natural Sciences in Lyons (1979) and the École Nationale Superieure du Paysage (ENSP) at Versailles (1984). He teaches at ENSP and has been a visiting professor at the Ecole Polytechnique Fedérale in Lausanne, the Institut d'Architecture in Geneva, the London Architectural Association School, the Accademia di Architettura in Mendrisio, Italy, and Harvard University's Graduate School of Design. Arnold Chan founded his London-based firm in 1984. Trained as an architect at London's Architectural Association, Chan's innovative and versatile approach to lighting design distinguishes his work, which maximizes the full potential of lighting as a creative tool. His projects include the Grand Opera de Lyon (Jean Nouvel, architect); Calvin Klein, Tokyo (John Pawson, architect); Kenzo, London (David Chipperfield, architect); Philippe Starck-designed Ian Schrager hotels in London (St. Martins Lane, Sanderson), Miami (Delano), and Los Angeles (Mondrian); and numerous restaurants, clubs, and residences. "The work of Herzog & de Meuron is at once new and timeless, subtle and radical, understated and experimental. They refine the traditions of modernism to elemental simplicity, while transforming materials and surfaces through the exploration of new treatments and techniques. This is an art of reduction and enrichment that moves architecture to new levels of experience and effect." "Herzog & de Meuron's work has infused architecture with an aesthetic energy that engages the beholder through both sensorial and intellectual pleasure. . . . It is impressive to notice that all of their work maintains throughout, the stable qualities that have always been associated with the best Swiss architecture: conceptual precision, formal clarity, economy of means, and pristine detailing and craftsmanship."